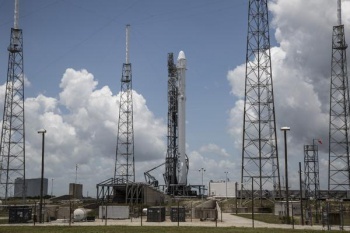 SpaceX's Falcon 9 rocket stands ready to launch much-needed supplies to the International Space Station this weekend. That is no easy task, yet its real challenge will be trying to stick the landing. Original: After a supply run by Russia failed earlier this month, SpaceX's Falcon 9 rocket is preparing to bring much-needed food, tools, experiments and a new docking port to the ISS. A private company making supply runs on to the space station is already the realm of science fiction - but if SpaceX succeeds in safely landing the first stage of its rocket this weekend, then they will truly make history. SpaceX's Falcon 9 rocket's first goal is getting a Dragon spacecraft - loaded with the supplies - into orbit. From there, the Falcon separates, pushing the Dragon on towards its goal, while the rocket itself drifts down to Earth. The hope is that the Falcon can land safely on a barge set up at sea, using a combination of parachutes and thrusters to keep it balanced. SpaceX's previous two attempts did not go well, but their failures taught their engineers a great deal. Elon Musk, owner of SpaceX, not to mention Tesla Motors, had given their most recent attempt a "50-50 chance." "This is an experimental trial to some extent," says SpaceX's Hans Koenigsmann. "You look at the data, you evaluate this, and then you make corrections, and that's ultimately how you succeed." If the Falcon 9 survives its landing, it will prove to be another momentous step in human space flight. SpaceX and companies like it have already begun to succeed in areas usually reserved for government agencies. Having a re-usable rocket like the Falcon 9 would hugely improve the efficiency of space missions like these. It certainly brings many sci-fi dreams to the fore. Space tourism is rapidly approaching feasibility; companies are ready to start mining asteroids for precious ores. What do you think? Is privatized space flight the way forward? Or should space remain the domain of government agencies?